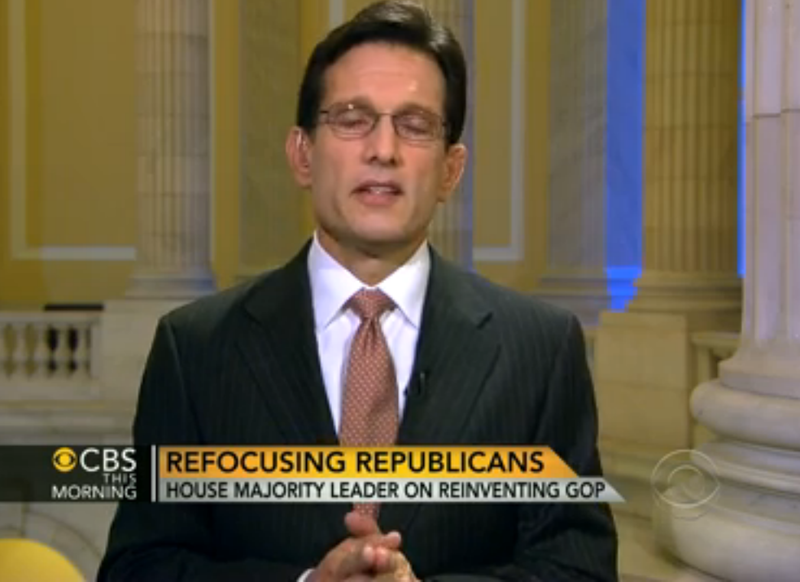 At multiple times during this interview, Eric Cantor (R-VA) displayed a nonverbal that a leader should never display unless he or she is speaking to young children - the "Pseudo-Prayer". This body language is one type of self-touching that does not fit within the category of a MAP (Manipulator, Adaptor, Pacifier) - although to those new to nonverbal discipline, it is often categorized as such. It's also not consistently visible in this example because The House Majority Leader's hands partially drop below the bottom of the camera view - but its effect can be felt with even this partial view. MAPs are types of self-touching which indicate anxiety. The pseudo-prayer (which is of course not limited to any political party) - where the fingers and palms of each hand are pressed together in what looks like a prayer configuration and is nearly always performed with at least a small amount of an up-and-down chopping motion component - is one of many hyper-alpha nonverbal communication signals. In distinction to MAPs, those who display this nonverbal are not feeling anxiety (during the moments of its display), but rather a patronizing and arrogant emotional tone. His extended blinking amplifies these condescending signals (What other nonverbal warning signal is present here?). Those with no body language training at all, will, to varying degrees, sense the strong disparity between what the speaker says and their true feelings - and thus it will destroy rapport. If someone does this to you, at the very best they are being insincere and duplicitous - and they may be preparing to skin you. Unless you are speaking to young children, do not use the pseudo-prayer and, if you are able, avoid those who use it towards you.